Your email list is one of your most valuable assets. It’s easy to ignore a blog or social media post, but an email, not as much. If a subscriber trusts you enough to fork over their email address, they’re more likely to click “open” in the inbox. 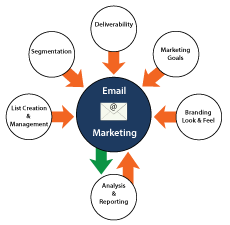 Make the most of your list with an optimized email marketing strategy. Strategize catchy and clear copywriting to increase open rates. Custom design newsletters to raise click-throughs. Combine strong landing pages with email campaigns to increase overall conversions. All too often, email marketers send off blasts of ill-conceived messages to their entire subscriber list. These annoying pushes often yield weak results and bring the added disadvantage of ticking off your subscriber base. However, when done right, email marketing can be an extremely effective strategy, creating meaningful dialogue between you and your recipients. Positive interaction and exchange of information will increase your ROI and bring you closer to your sales objectives. DEFINE YOUR AUDIENCE: It is important to know your demographic and define your readership. Who are your subscribers? How did they sign up for your list? What type of content are they looking for? DETERMINE CONTENT: Most recipients spend very little time viewing emails. Content must stand out and match the interests of your audience to stop them from clicking delete. Winning content is relevant, shows some personality, and honors your subscribers’ time. Content might include items like company news, new products or services, upcoming events, event recaps, employee/member profiles, photos, links to popular blog posts, etc. DESIGN: Layout and format of your emails should support easy perusing of content and quick follow through on calls to action. Clear sections and easy readability are a must to improve click through rates. SCHEDULING AND ORGANIZATION: Rather than randomly sending out emails at intermittent intervals, your campaign should operate on a regular schedule (e.g. monthly, weekly, etc.). To help you stick to your schedule and meet delivery goals, potential news items, sources for content, photos and other materials should be kept organized and ready to go when it’s time to write and publish. DIRECTING TO LANDING PAGES: Since the goal of an email campaign is to drive traffic to your website, we build landing pages that sync with the email campaign. Once on the landing page, you can direct readers to further calls-to-action for your product or service. TARGETING MESSAGES: Once your campaign is underway, evaluation is needed to gain insight on who is reading your content. Using analytics, we can help you target only those users that are likely to read your emails based on past history.. By narrowing your audience to a more specific group, you can customize messages and calls to action that are more likely to convert. A/B TESTING: To determine changes going forward, A/B testing is critical to a successful campaign. A/B testing compares two versions of a page or page element and tracks resulting user actions. By comparing results like click throughs and open rates associated with each variable, we can change future email strategies and content based on what is working or not.